Looks like I will be making my last visit on Saturday. I might play "Taps" as I eat a large combo alone in my apartment. leek wrote: I would bet that if they were in a place with better foot traffic that we wouldn't be having this discussion. There are other places that failed nearby to that location that did have what you say people want - more upscale ambiance, some with liquor license, and consistent food/service. That's just an awkward area for restaurants. Not really Logan Square or Bucktown, middle of the block, and with awful construction on Western lately. I live nearby as well, and completely agree with all the points you made. On top of being in an awkward location it's also on a stretch of Western that has a number of other great options for take out food (Las Asada, Red Hot Ranch, Arturo's). They also were late to start delivery, and when it first started there were nights that they didn't have a driver. While I may have just had bad luck, I found that the chances of them actually having delivery available to be 50/50. Some of the responses in this thread (including some of my own,) make me wanna do more volunteer work. In all honestly, I would have gone here more had it been more consistent. But I'd much rather have it inconsistent and within reach than more remote. And likely still inconsistent. I'm in the tips & links camp; that's all I order at H1 or UJ's when they were still open (in the old location). Last Sunday I volunteered to make the halftime run (early game) from the South Loop to H1. Just me and a friend so I got the Xtra Large tips and a Large links (there is no Xtra for the links). Thought this would satisfy Mrs. Kman's request to bring home leftovers. Left 30 seconds b4 halftime and returned 2 minutes into 2nd half, not bad. My friend and I each ate a link and a fair amount of tips - full! Then another friend showed up - another link, more tips. Still some leftover so looking good. Then friend's wife returned home and, whoops, there it was! Everyone loved what they ate. The links were terrific and the tips were spot-on. I hope the move to Bronzeville works out for them. I'll miss having the north-side location but the run from the South Loop will be even easier, so it's kind of a push. Honey 1 BBQ, Count me a Fan! Three pieces of bread? You are somehow special? epicFades wrote: ^It's G Wiv, dude. Being historic fans of both Honey 1 and Lem's rib tips, we decided one day last October to do a back-to-back tasting of the two places for direct comparison sake. I'm definitely from the school that thinks that since aquariums quickly smoke meats at way too high a temperature and don't appropriately break down the tougher cuts of meat typically used (meaning high n fast, not low n slow), Chicago aquarium-style BBQ should always be eaten right as a place opens. From my experience, the half-life of aquarium-style BBQ rivals that of a neutrino. So, we decided the best course of action would be to hit Honey 1 right as they opened (11pm), then make our way to Lem's for their 1pm opening in hopes of ensuring optimal freshness. H1's tips came out thinly cut and imparted a strong but pleasant smokiness. Although much of the tip's fattiness had been rendered out, they were still moist as hell while still retaining a pleasant amount of fat - a necessity and desire for any decent rib tip. On this day, Lem's tips tasted a bit tired and had us wondering whether they had actually reheated them from the previous day's closing, then served them to us first thing the very next day. I enjoy a decent pull to my tips but these bordered on leathery. Decent but not one of their best efforts. As everybody knows, one BBQ outing does not make a credible opinion. But, on this day, Honey 1's tips bested Lem's. Robert, Jr. told me a few weeks back while throwing rocks at the Diversey Bowl that it isn't a certainty that they'll be closing their Logan Square location. I'll miss them if they decide to do so being right in the neighborhood as well as being swell people. OK. But what of the giant and eccentric menu at the Diversey Rock n' Bowl? I will personally vouch for the dragon turds and a passable tavern thin with the same Italian sausage, but what do we know about the scratch fried chicken, many pastas, not to mention the pot pie and the ginger teriyaki chicken and rice?? Further research needed. Also forgot to mention the ceviche and beef Stroganoff. There's an odd joy to this epic menu, the suggestion that everyone at the alley got to add their favorite dish, no matter what. PIGMON wrote: I'm definitely from the school that thinks that since aquariums quickly smoke meats at way too high a temperature and don't appropriately break down the tougher cuts of meat typically used (meaning high n fast, not low n slow), Chicago aquarium-style BBQ should always be eaten right as a place opens. From my experience, the half-life of aquarium-style BBQ rivals that of a neutrino. I think your theory has merit, but in my experience (unless you're a friend of the house), hitting places right as they open results in being served yesterdays reheated leftovers in may cases. Your experience at Lem's bears that out. My approach is to hit a place an hour or so after they open. They usually insures fairly fresh Q.
PIGMON wrote: Robert, Jr. told me a few weeks back while throwing rocks at the Diversey Bowl that it isn't a certainty that they'll be closing their Logan Square location. I'm not sure what Jr. was smoking that night, but the Western Ave. location will be closing the moment the place in Bronzeville is ready to open. Robert Sr. is counting the minutes. He can't wait to get out of there. My best luck at aquaria has been during busy times, whenever it happened to be. Tips and links are definitely best right off the fire and undercooking doesn't seem to happen so that's not a real concern. Running out or long waits are, though. PIG: what did you guys eat at Diversey Bowl? Or did you just grab Tacos de Caveza down the street? This thread has been educational. Here's the main thing I learned: the only consistently good products of aquarium-style barbecuing are rib tips and sausage links. Maybe this was so obvious to BBQ aficionados that it seemed to go without saying, but it was not at all obvious to this particular non-bbq-aficionado, and I'll venture a guess it was not at all obvious to most non-bbq-aficionados who've read this thread and, more unfortunately, to many locals around the North Side Honey 1 location. It's a shame that it went almost entirely unsaid until just recently. I searched through this whole thread and searched through the entire Eating Out in Chicagoland thread, and I found almost no mention at all, until seebee's illuminating post #609 in this thread and in the responses that that post prompted, of why aquarium smokers are good for tips and links but not so good for other types of bbq. I did find earlier mentions of this point made by JeffB in this Honey 1 thread (#115) and also in a thread on Lem's. There might have been a few more comments in this regard somewhere else, but the pickings were so slim that I got tired of looking. What I think you will find if you reread this whole thread is what I found: many positive comments about Honey 1's tips and links, what appears to me to be a roughly 50-50 balance of positive and negative comments about their ribs, and occasionally a negative comment about their tips and links (mostly pertaining to whether they seemed freshly smoked or reheated). Search for "tips" or "links" and you will often find 20 mentions on a single thread page. Search for "ribs" or "aquarium" (by way of searching for an explanation), and you will find 1 or 2 mentions on some pages, 0 on many others. So, yes, there was a lot of support for Honey 1's tips and links, but hardly any comment or explanation of why that was pretty much all Honey 1 was worth going to for. Katie wrote: Search for "tips" or "links" and you will often find 20 mentions on a single thread page. Search for "ribs" or "aquarium" (by way of searching for an explanation), and you will find 1 or 2 mentions on some pages, 0 on many others. IIf it wasn't clear, that applied strictly to searches of this Honey 1 BBQ thread and only to rib tips and sausage links. JeffB wrote: OK. But what of the giant and eccentric menu at the Diversey Rock n' Bowl? I will personally vouch for the dragon turds and a passable tavern thin with the same Italian sausage, but what do we know about the scratch fried chicken, many pastas, not to mention the pot pie and the ginger teriyaki chicken and rice?? Further research needed. I have no idea about the food but laikom/Teresa sampled a few items during league play. Maybe they can chime in. I was too busy unsuccessfully trying to pick up 7-10 splits all season. BTW, our bowling team, The Little Larry's, which was comprised of Laikom, Teresa, O'rdirv, me, and milz50 in reserve, made a vallant effort at first place in the league. But it was not to be. Friends visited Honey 1 last night, they inquired about their pending closing. They plan to close the north side operation only after the south side location opens. While they hope to do this soon, as of last night there was no fixed date. While helping prep food for the Salvation ARmy Christmas dinner, I was surrounded by several restaurant owners who had new places pending. If all their original plans for opening had come to be, they would have been open months earlier. Instead, they could only look to the future. The biggest issue seemed to be with the city and scheduling inspectors with plumbing backed up for months (no pun intended). We had delivery from Honey 1 last night - a tips/link combo plus a rack of ribs. 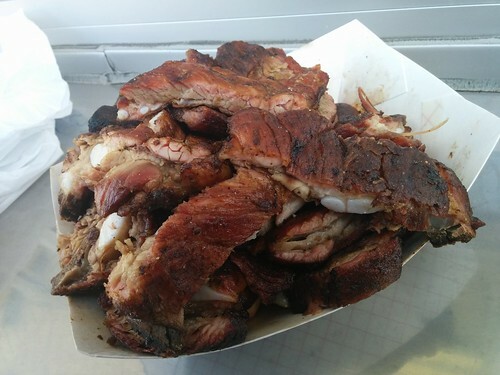 The tips and links were good but not great, and the ribs were mediocre (very tough). The fries were soggy (this may be the result of getting delivery rather than going to the restaurant itself, but nevertheless they were obviously a Sysco-like frozen product). My wife said, "We don't need to order from there ever again." No reason to complain about Honey 1's fries -- they're exactly what they've been since day 1 and you won't find better fries at any of the aquarium joints -- at least in my experience. And no, that's not necessarily a compliment. Though in my opinion, the fries at Honey 1 serve much the same purpose as the bread, and that's just fine with me. Anyway, I happily gnawed on my tips today. A little less fatty than I prefer but meaty and delicious. I'll miss them a bunch when they leave the area, though my personal north side favorite was and always will be the long departed Edith's. Has she really been gone about 20 years? 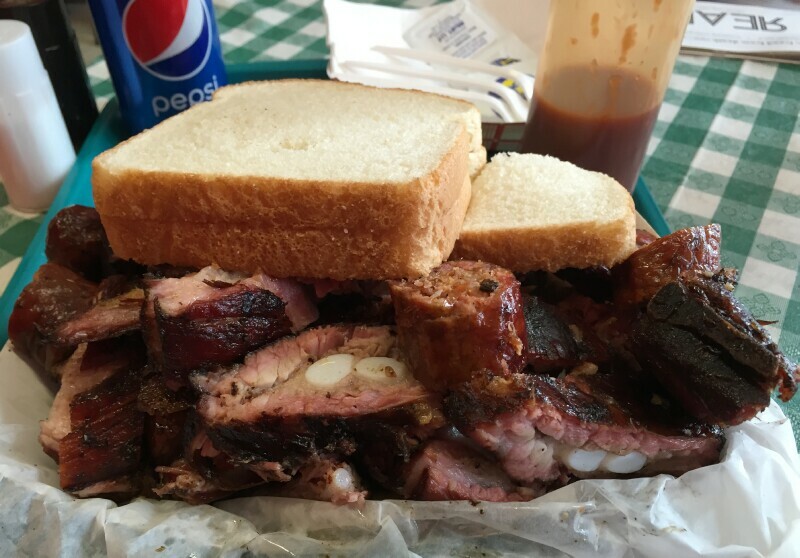 There are a lot of great bbq items to be found on the north and south sides of this city these days, but with Honey 1's impending departure, I'm not aware of any place where I'll be conveniently able to find my beloved rib tips. How is Ben's in Austin for tips/link? kenji wrote: How is Ben's in Austin for tips/link? PIGMON wrote: From my experience, the half-life of aquarium-style BBQ rivals that of a neutrino. As it turns out, neutrinos don't have half lives since, as far as we can tell, they do not decay. If they don't run in to anything they basically last forever. Now a neutron, with a half life of about 10 minutes, would be a reasonable comparative. For the sake of hyperbole you might want to use the Higgs boson with a half life of 1.56×10^−22 (1.56/10000000000000000000000) seconds. Made what will likely be my final trip to Honey1 today. Like BR said, the tips were less fatty than usual, so they were a bit tougher and a touch dried out. Didn't stop me from nearly finishing a large. Normally, I think the tips are the star and the links a great supporting cast, but the hot links were so damn on point today. Smoky, juicy, and a great snap from the casing. Definitely the best H1's links have ever been in my experience. The fries are never good but they remind me of my high school days eating Sysco fries drowned in BBQ sauce. I don't know if I will ever make it down to Bronzeville, so thanks for the memories, Honey1! Mainly, about the idea that aqua-q is all about the links and tips. As Kenji notes above, it was very common in the not too far past to order from a rack, either end. And if your memory goes back like beyond 10 years, you know that ribs were not a, not thing to order at Edith's or any similar place. And if your memory goes really, really back, you remember getting ribs at Boobies from an aquarium--showing, I know with no other evidence, that aquarium style ribs were a bigger thing and also not an exclusively, well how shall I say, urban, thing. If I understand my mother, I think her beloved Sally's in Roger's Park also used an aquarium. Now, what I think mostly what happened is that rib's, both spares but especially baby-backs, got priced out of the market. Yes, places like Lem's and Honey1, etc., still offer ribs, but at a price that is MUCH higher than the tips. I could be way off base here, but my feeling is that the spread between ribs and tips was not nearly so wide in the good ol' days. All this leads to a vicious circle. If you don't sell a lot of ribs, well, you don't sell a lot of ribs. We all know why. 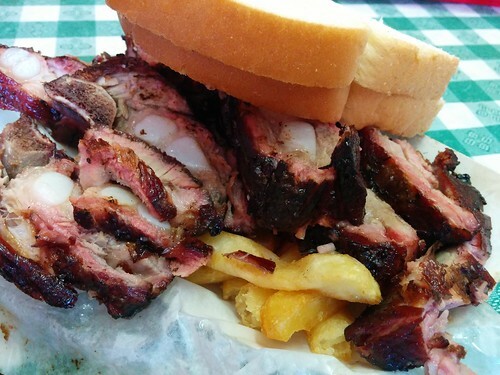 On the converse, Lems, which still has a following for its ribs, does ribs very well. Vital Information wrote: I could be way off base here, but my feeling is that the spread between ribs and tips was not nearly so wide in the good ol' days. Vital Information wrote: If I understand my mother, I think her beloved Sally's in Roger's Park also used an aquarium. Sally's had a pit but I don't recall whether they used wood or charcoal. The ribs were then finished under a broiler before serving. 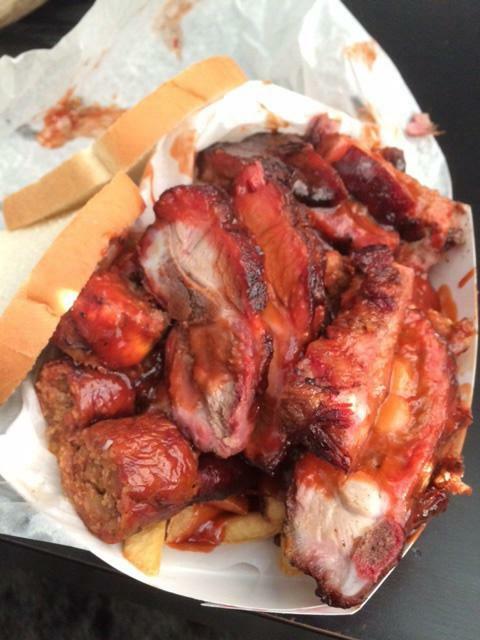 Growing up on the north side, I never even heard the term rib tip until I was probably 40 years old. And I never even tried them until I started reading about it here on LTH.